an article or random bits on the subject(s) of business, entrepreneurship, thoughts. When I decided to strike out on my own and start our design studio, Shop, I was poorly prepared for what starting an agency / running a business really entailed. The hurdles I faced during the first year were numerous—each one with varying levels of seemingly endless learning curves, twists, turns, u-turns, and stumbling points. These experiences were both taxing and exhilarating. Yet, there was one area that I struggled with more than any other. Time. The place I’ve had to focus and re-focus my energy more than any other is in the area of time—both my perception of it and its management. Efficiency, success, and long term sticktoitiveness are so integrally locked into time management that if you’ve got an issue with it, as I do, then you end up in a consistent loop of doubling down on your focus in order to try to keep on track, move forward, and get stuff done. That’s not, however, the best way to play the entrepreneurship game. I realized fairly fast that I needed a system to help me manage my time, or I was going to fall into the deep, dark hole of failure. 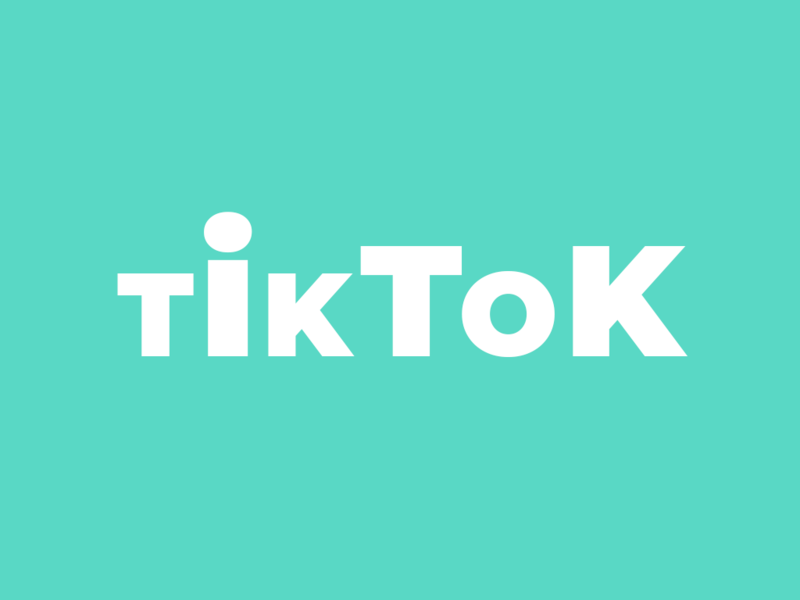 So, I set about building a framework (more to come on that) to help me out. I realized fairly fast that I needed a system to help me manage my time, or I was going to fall into the deep, dark hole of failure. Let me begin by saying I have by no means figured time management out. It’s a constant process of refinement for me. There are, however, a few things that have worked fairly well. So, embrace the subjectivity of these next sections. Feel free to try some of these out. If they don’t stick to the wall, it means the pasta’s not done. 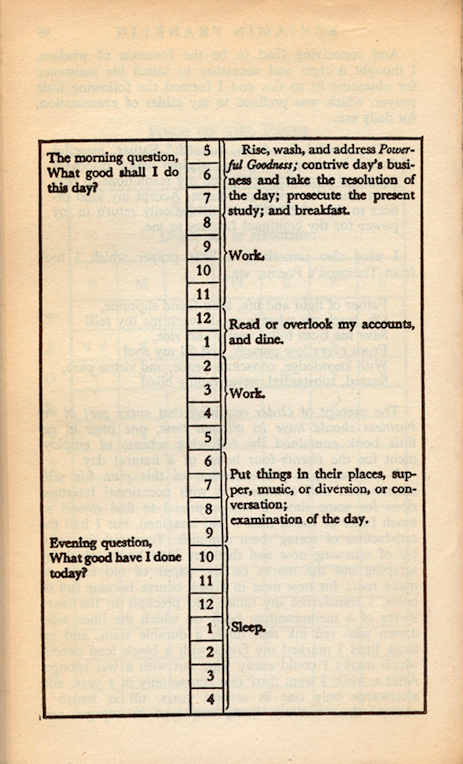 Several years ago I read an interesting article about Ben Franklin and his process of daily time management. It seems a diary of Ben’s time had been found in some long forgotten, dust filled Americana dumping ground somewhere in the East. For the most part the schedule discovered was nothing out of the ordinary. Tasks were broken out into increments of time spanning the entire length of Franklin’s day. The part I found interesting was what came at the end of his daily work day—reflection. A look into how a founding father spent his day. The note was simple, “Evening question, What good have I done today?” The idea of stopping and taking time to contemplate what went well and what did not go well each day was simple but revelatory for me. It was also key to helping in the perception of time. When we are knee deep in the daily grind for months on end it is nearly impossible to properly perceive time—at least it is for me. Things blur together, events are muddied, timelines become confused. The simple task of re-centering daily, however, seems to make quite a difference in how I retain time. The idea of stopping and taking time to contemplate what went well and what did not go well each day was simple but revelatory for me. By mentally knowing where we are in our day and what we accomplished (some call this being present) we become better at managing the overall time chain of our daily lives. As soon as I started reflecting and thinking about my day I started to see some differences. We are designers. We thrive on systems, and time is another area where we can apply a well structured system in order to help better manage our lives. Breaking down each day of our week into a solid, mostly immovable, schedule AND putting it into effect is a system of sorts. Finding the commonalities, things that happen each and every day, and keeping those consistent help to build a framework that fosters and enhances productivity. It also brings predictability, which if you struggle with focus and managing time, is essential. Adhering to your schedule daily helps to build stability, much like the foundation of a house. The more you do it, the stronger the foundation on which your business, career, etc. are built. Those points where I’m feeling I don’t have enough time, or alternately, when I have too much time I can generally attribute to me actually not proportioning my time properly (read ignoring what I need to do). This is where focus comes back in to play. While having a solid daily schedule and reflecting on my day seem to reduce the amount of intense (doubled down) focus I need, It’s still an essential component in managing time as an amount. Losing focus or letting it lapse means I’m not managing the load properly, creating the illusion of free time (again, ignoring what I need to do) which leads to the converse of then not having enough time to get things done. It can be a spiral, but if I employ a process of active focus, I am much more effective at managing my life. Again, let me say I have by no means figured this process out. I may never get my work day to be as efficient as I think it should be. In reality, the best way to manage time is the one that works best for you. Perhaps you’re a Pomodoro fan or just a crazy multi-tasker that rage feeds on deadlines. If that’s what works, then it works. If you struggle with your focus and you’re looking for a few ideas then maybe stability, reflection, and focus are a magic three. I only know what has worked for me, and even that is not bullet proof.